My road to becoming an inventor and animal scientist began in boarding school. I attended my classes, but I was more interested in the horses than anything else. I was lucky because both my mother and the school’s headmaster encouraged me to learn everything I could about animals and science, and my teachers allowed it as long as I was on time for classes and meals and took care of the horses. In addition to riding, that meant grooming, feeding, and mucking out the stalls. Summers at my aunt’s ranch were also extremely important; I spent all my time with the cattle and horses learning everything I could about their behavior and how to communicate with them. Another influence was John C. Purves, my maternal grandfather. He was an inventor and one of the great role models in my life. When I was a child, I asked him endless questions about the world around, such as Why do the tides on the seashore go in and out? When I was diagnosed with autism (as a child in the 1950s), most people didn’t really know what it was or the different ways it affected people. Now, we say that a person is “on the autistic spectrum,” which can mean many things. They may have normal speech, or they may never learn to speak at all. I was a late talker, I hated being hugged or held, and I was often in my own world. I had so much difficulty sitting still that Mother used to say to me, “Go outside and run the energy out of you!” I also couldn’t stand sudden sounds or any clothes that were too scratchy, and I would become very agitated when my world was changed in any little way. Others rock back and forth all the time or need to spin themselves around and can’t pay attention. Many can be socially awkward and unable to make eye contact, yet can have successful careers in tech companies, industrial design, the arts, or a job that requires attention to detail. Some develop special skills at a very advanced level, often in the areas of mathematics, art, computers, or music. Some great scientists and inventors were probably on the autism spectrum. Autism is not “one size fits all.” The more we learn about “the spectrum” (the range of abilities and deficits an autistic person may have), the more we will understand different kinds of minds and how important different kinds of thinkers are—especially where creativity, innovation, and invention are concerned. I like to think of myself and other people who are different kinds of thinkers on a human spectrum. Though our brains may work in different ways, there is no limit to the kinds of contributions we can make. I got teased a lot in school because my social skills weren’t all that great. I knew I didn’t fit in, but I didn’t know why. The kids called me “tape recorder” because I repeated things over and over in a kind of monotone voice. I cared more about working on science projects and making fancy horse bridles than about the high school dance. Kids still get teased today for differences. Today, I would probably be called a nerd or a geek. Though it’s also true that nerds and geeks tend to win Nobel Prizes and run Silicon Valley. Teachers and parents worry about the quirky kid who draws all day or the one who cares only about insects. They want kids to be well-rounded, but those single-minded kids may grow up to create and do incredible things if we encourage them to pursue their interests. At least that’s what happened with me. My love of horses and cattle as a teen became the basis of my career as an animal scientist. No question. However, the main reason I also became an inventor is simple: Ever since I was a child, I’ve always loved making things and working with my hands. If one of my projects failed, I would experiment for many hours until I got it to work. When I was young, my mother let me use every kind of material from around the house to create my experiments, from her old clothes and scarves to the cardboard inside my father’s shirts when they came back from the cleaners. That cardboard was treasure! I could make a million things with it: building blocks that became forts, dioramas, models, and jumping jacks. I loved taking things apart and putting them back together, or making new inventions out of the pieces. 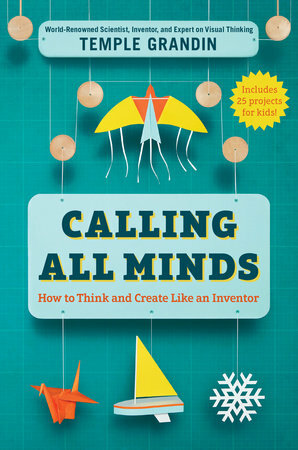 You’ll find lots of these projects in this book, but I also encourage you to experiment and design your own. Remember: instructions are only guidelines. Sometimes my students will come to me very upset because they followed the directions to an experiment perfectly, but it didn’t produce the desired result. I tell them the same thing: you have to experiment with the experiment! If I had to boil this book down, my message would be this: Make Things. The future holds many crucial challenges such as understanding the impact of climate change, curing diseases, and ending hunger. We need all kinds of minds if we are going to figure how to adapt. If we lose the ability to make things, we will lose a whole lot more. We need people who can cast iron and chemists who can create new materials that are lighter and stronger than metal. We need new storytellers, filmmakers, musicians, and artists. And we need new technologies to explore the future, including a deeper and more complex understanding of the earth and the ocean and the galaxies. There is no better way to start than by making things of your own design. All the projects I made when I was young contributed to the inventions I’ve made throughout my life. And they have given my life meaning. I hope these projects and the ones you create will do the same for you.